As his organization has grown, Rabbi Mark’s unique take on addiction treatment (“Addiction is a hole in the soul. It is a spiritual malady that says there is something inherently wrong with you. Recovery is about understanding that You Matter and you are a holy soul.”), has solidified him as an expert and visionary in the field. 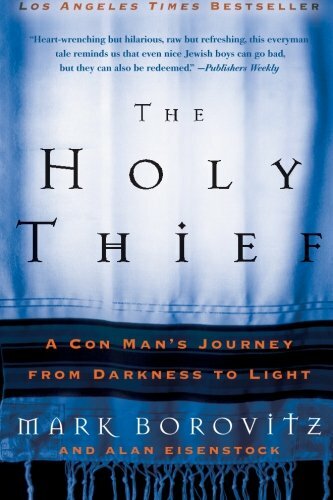 He co-authored his biography, The Holy Thief: A Conman’s Journey from Darkness to Light (Harper Collins) for which the rights were recently optioned. Rabbi Mark has been featured in articles in the Los Angeles Times, Moment Magazine, The Jewish Journal, The Wall Street Journal and newspapers across the world, including Israel’s largest publication, Haaretz Daily Newspaper. Rabbi Mark Borovitz’s tireless efforts have been the driving force behind the robust and growing movement that is Beit T’Shuvah. His newest book, Finding Recovery and Yourself in Torah: A Daily Spiritual Path to Wholeness (Jewish Lights Publishing), will be released March 14, 2016. Torah on the ground, in the moment. This book can save your life. No one knows more about saving lives than Rabbi Mark Borovitz. For thirty years, Rabbi Mark has rescued hundreds of lives from addiction, alcoholism and criminality. Addiction, he teaches, is a disease of the soul. Recovery is a process of healing the soul. But the soul-wisdom of recovery is not restricted to those addicted to drugs or drink. The soul-wisdom of recovery is for all who are battered by loneliness and meaninglessness, all who are lost in this culture of materialism and superficiality. 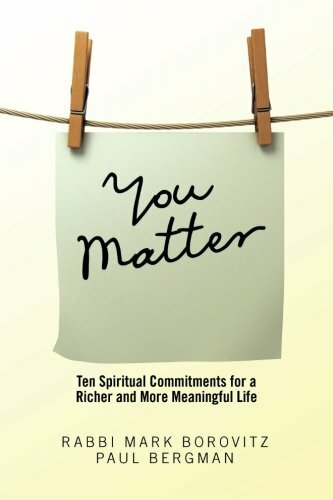 All who seek depth, authenticity, intimacy and purpose need to hear Rabbi Mark's powerful wisdom – You matter! This book will save your life. Hundreds of thousands of people will die this year from drug abuse and yet, fewer than one in five people who need treatment will actually receive it. While this epidemic has only recently attracted the attention of the global population with newly published research and widespread news coverage; these problems are actually no different than those faced by our ancestors. The Torah is the first "Big Book" of recovery from addictive thinking and acting. For each Torah portion, he provides seven days of teachings and reflection questions to help you reconnect with your sacred self, discover solutions to life’s challenges and to help you heal. This book is for all people; those in recovery from substance and process addictions who yearn for resources that address addiction as a spiritual malady as well as a life-threatening disease and anyone looking for a deeper understanding of themselves and the Hebrew Bible. It is an ideal companion to 12-step programs. — Jimmy Iovine, Entrepreneur, co-founder Interscope records, chairman of Interscope Geffen A&M, co-creator Apple Music. — Rabbi Rami Shapiro, award winning author, poet, essayist, and educator who holds both Ph.d. and D.D. degrees from Hebrew Union College, he is also a congregational rabbi for twenty years, and currently the Adjunct Professor of Religious Studies at Middle Tennessee State. Mark Borovitz was a mobster, gangster, con man, gambler, thief, and a drunk. He's seen it all. In this inspiring memoir, he takes you on a journey from the streets to discovering his soul in a prison cell. When Mark was fourteen, his father died and his world came crashing down. He stole, gambled, and drank, beginning a twenty-year life of crime, all the while trying to be the good son, the good brother, the good boy, but his life only spun more out of control until the mob put a hit out on him. After his release from prison, the drinking and thieving continued until, at the edge of oblivion, he experienced a moment of true divine intervention, a startling revelation that saved his life. Mark Borovitz proved that you can change your life -- profoundly. He is now the rabbi at Beit T'Shuvah in Los Angeles, the House of Return, a rehabilitation facility for addicts of all kinds. The Holy Thief is the remarkable memoir of an amazing man. It is a true-life gangster story, a passionate love story, and a case of study in redemption. Regardless of your faith, you will find his story tragic, funny, uplifting, and inspirational. Rabbi Mark knows the value of time. But he also knows the importance of the lessons in the Torah and the challenge of conveying them quickly. For that reason, Rabbi Mark offers the virtually impossible: providing a 3-minute lesson on the weekly parashah, expressing fresh and unique interpretations of the parashiyot, and how each continues to provide completely relevant wisdom in the millennial age. Looking at Torah as a living narrative with current, germane implications, he has been known to call Abraham a "pimp," Sarah a "whore," and God the "original prankster." This is Torah as you’ve never quite heard it before; with insights that may alternately shock, comfort, surprise, disturb, and resonate with you. They will make you think and understand the Hebrew Bible like never before. 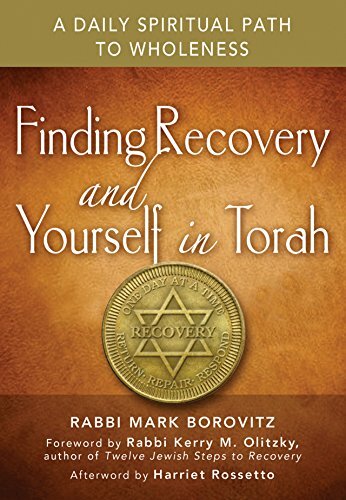 These videos provide just a taste of Rabbi Mark’s Street Torah – for a comprehensive understanding and immersion in all Five Books of Moses, check out Rabbi Mark's new book: Finding Recovery and Yourself in Torah: A Daily Spiritual Path to Wholeness (Jewish Lights Publishing). I met Harriet Rossetto while I was incarcerated at the California Institute for Men - she in a relatively new position as the social worker helping Jewish criminals, and me, a Jewish criminal. But we didn't recognize our fit at first: she thought I was loud and brash, and I thought she was cold and uptight. Our journey together is a testament to the power and beauty of giving people a second chance! When I was released from prison in 1987, I found it difficult to find work because of my background and I took her up on a challenge to see if I knew how to help with rehabilitation and reentry any better than she did. I found myself knocking on the door of Beit T'Shuvah - at the time, a small halfway house for men - neither one of us really knows to whose greater surprise. Harriet Rossetto is a rebel spirit. A self-professed misfit, Harriet answered a fierce calling: helping broken souls and changing a broken system. Harriet’s belief that addiction is a malady of the soul that requires spiritual healing inspired her to create the Beit T’Shuvah community that, for nearly thirty years, has supported the process of recovery. Since founding Beit T’Shuvah, which now boasts over 150 residents and 115 staff members, Harriet has become a model of authentic living, a heroic activist, an insightful friend, and a relationship “guru.” She mentors countless social workers and therapists across the nation, and, in 2015, was selected by the White House’s Office of National Drug Policy as one of seven honored “Advocates for Action,” for her groundbreaking innovation and influence. Harriet is an educator, a counselor, a consultant, and an advocate for the soul. Her book, Sacred Housekeeping: A Spiritual Memoir, which recounts her incredible personal and professional story, is part of the nationally recognized core curriculum of Beit T'Shuvah. Harriet Rossetto is my ezer k'negdo, my help meet. And I am honored beyond words to be hers. My queen of the misfits. are you in recovery, or In denial? Deeply rooted in rabbinic tradition and text, Rabbi Mark offers a bold take on Judaism, abstinence-based recovery, and a decidedly accessible immersion in "Street Torah." He has become a highly-sought after and featured speaker at many seminars on spirituality and recovery, including: CASA at Columbia University; Spirituality Day at Northwestern University; an extensive list of Rabbinic conferences and Jewish seminaries; Congregational conferences; Interfaith forums; UCLA’s Hillel; USC’s Hillel; and has been a Scholar in Residence in New York City and State; St. Louis & Kansas City, MO; Tucson & Phoenix, AZ; Minneapolis, MN; Cleveland & Columbus, OH; Atlanta, GA; Baltimore, MD; Philadelphia, PA, and more. Available for speaking and educational engagements of varying lengths from a single Lunch and Learn, half- or full-day seminars, entire weekend immersions, and/or leading services and seminars for a Shabbaton at your congregation.